Tess Ward’s Celtic Wheel of the Year is a book of new and original prayers weaving the two strands of Celtic Christian and Pagan traditions into a single pattern of prayer. Divided into monthly sections with a daily pattern of prayer, it combines Christian and Pagan ‘holy days,’ drawing on Celtic themes of the presence of god in all life. Each chapter has a rich introduction to the weather and natural landscape of a typical month, as well as the themes and celebrations of that month. For example: In January we celebrate New Year, Epiphany, Twelfth Night; in February, Brigid, Imbolc, Candlemas, Valentine, Shrove Tuesday, Ash Wednesday; in March it is Lent, Spring Equinox, St David, St Patrick, Mothering Sunday and so on. Other celebration days include: Mountains and Hills, Rivers, Music, Colour, Wisdom, Crone, Pilgrimage, Dog Days, Sea, Trees, Silence. Also included are devotions for morning and night. The text is beautifully illustrated by Clare Arnison-Newgass. The descriptions are earthy and very British, so much so that readers might not understand the sense of the descriptions if their climate is very different from that of the British Isles. The language connects strongly with women’s spirituality and feminist themes, which might put some readers off. 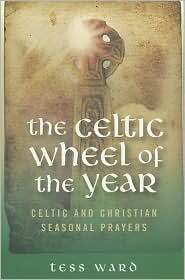 Although other writers, notably Caitlin Matthews, have written prayer books drawing from the Celtic Pagan-Christian well, I think Celtic Wheel of the Year is particularly wonderful. It is one of the most original liturgical books I have ever seen, and since the art of crafting creative liturgy is rare we need to cultivate more liturgists of this exquisite a caliber. Ms. Ward is an Anglican priest who clearly understands the idea of clergy in service to the community and the sacred. Celtic Wheel of the Year is her gift to the combined community of the world. For many of us who are married or partnered with Christians, or are Christian and partnered with Pagans, this book is a beautiful addition to our library, for reference, use and inspiration.